Sift the sugar, flour, cinnamon, and sea salt together and set aside. Place the dates, raisins, nuts, bread crumbs & chopped apple in a large bowl. Mix the baking soda and hot water together, then add to the fruit and nut mixture. Stir in the egg. Add the dry ingredients to wet mixture and combine. Pour into a greased steamed pudding mold & snap lid into place. Or you can use a deep, sturdy ceramic bowl covered with two sheets of aluminum foil and secured with kitchen twine. 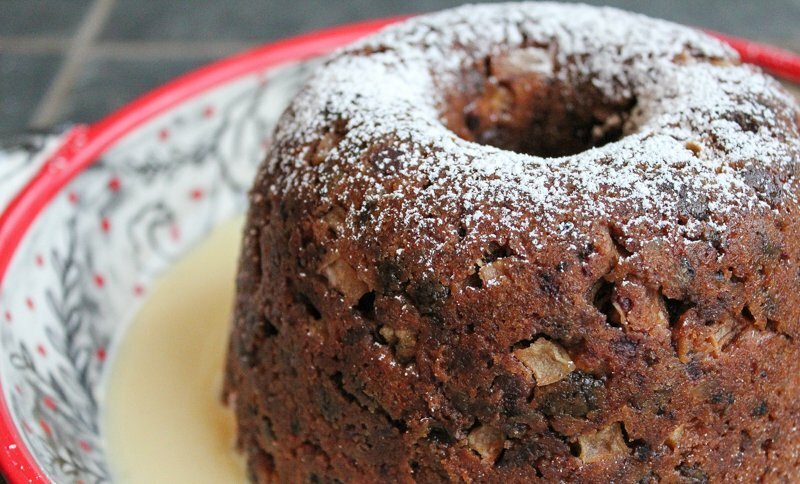 Place a rack in the bottom of a large one-gallon pot and put the pudding mold on the rack. Fill the pan with hot water to approximately 3” below the top of the mold. Cover the pot and bring the water to a gentle boil. Once boiling, lower the heat so the water is at a rolling simmer. Make sure no water is getting into the mold! Cook for approximately two hours, adding water as needed. The pudding is done when a cake tester or toothpick comes out relatively clean – the fruit may make tester look a bit sticky! Carefully take the mold out of the pot and remove the mold lid. Place the mold on a rack to cool for several minutes. When cool enough to touch, invert mold onto another cooling rack. Slice and serve warm with traditional brandy or rum enhanced hard sauce.